Stairs & More, working with Eurostair AB a major Swedish manufacturer, now provide the highest quality steel staircases for industrial and commercial use. Straight stairs suitable for inside and outside use as access and escape staircases. By using the best possible design, our range of commercial stairs provides cost effective solutions with products that reduce installation times. We also offer custom built staircases and platforms designed to the client specification. Standard staircases comply with all applicable building regulations and standards. Products are delivered fully assembled and ready for installation. 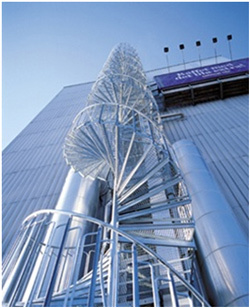 The Eurostair spiral staircase is the result of enhanced product development and ingenuity. Manufactured with extra high strength steel to reduce weight and maximise performance, this makes it easier to handle during assembly. Designed with a minimum 70% use of standard components, our spiral stair offers faster installation and delivery times whilst retaining maximum flexibility in number of steps and height between them. Due to the strength of the steel used our spiral has type approval to 50m – far more than any other standard fire escape.